Add news to corporate web applications in minutes. NewsInjector is a specialized Content Management System (CMS) targeted at news management for web applications. It inserts news into existing web applications without the need for programming or web page redesign. No complicated database setup or configuration is necessary. Integration of news into your web application is very easy and fast. Add news to corporate web applications in minutes. Simple News Management CMS. ...... 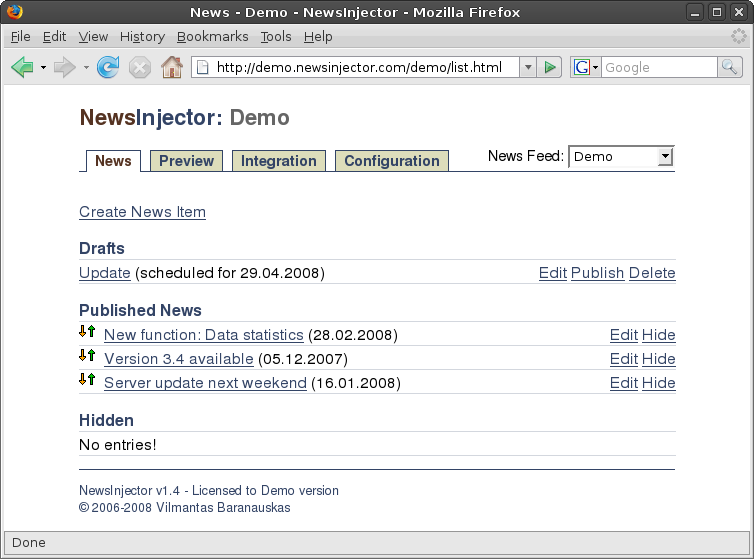 Integration of news into your web application is very easy and fast: Install NewsInjector, copy-paste HTML code snippet to your application, write and publish news. All you need to manage news is a simple web browser. Spend time writing news instead of figuring out how to get them into your application. Qweas is providing links to NewsInjector for Mac 1.4 as a courtesy, and makes no representations regarding NewsInjector for Mac or any other applications or any information related thereto. Any questions, complaints or claims regarding this application NewsInjector for Mac 1.4 must be directed to the appropriate software vendor. You may click the publisher link of NewsInjector for Mac on the top of this page to get more details about the vendor.